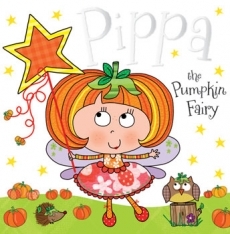 Halloween books don’t get much cuter than Pippa the Pumpkin Fairy! After reading the book with my daughter, we made a sparkly pumpkin wand, a Boo’tiful pumpkin patch, and pumpkins with funny-ha-ha faces. We enjoyed making these ‘mommy and me’ crafts together and Big Brother even joined in for some of the painting parts. 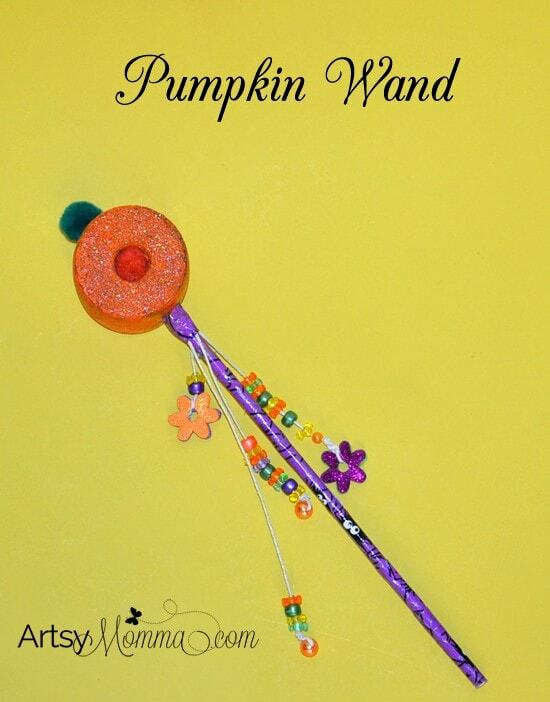 Little Sister loves pretending to make things with her pumpkin wand – adding sparkle to everything. She also pretended to make the pumpkin patches with the wand too. *This post also contain Amazon referral links to a few of the products mentioned in this post. 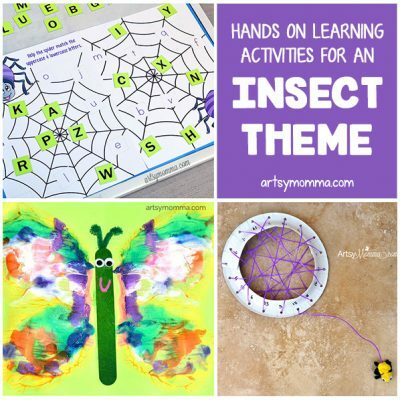 Please note that this is not a sponsored post but most of the craft supplies we used were sent to us for free via CraftProjectIdeas.com to use and showcase the used products in our craft posts. We love their products! They are reasonably priced and they offer a HUGE variety of crafting essentials and other fun art supplies as well as kits. You can purchase their products at Walmart (it will say Horizon Group on the packaging). This is an adorable Halloween story for younger kids. 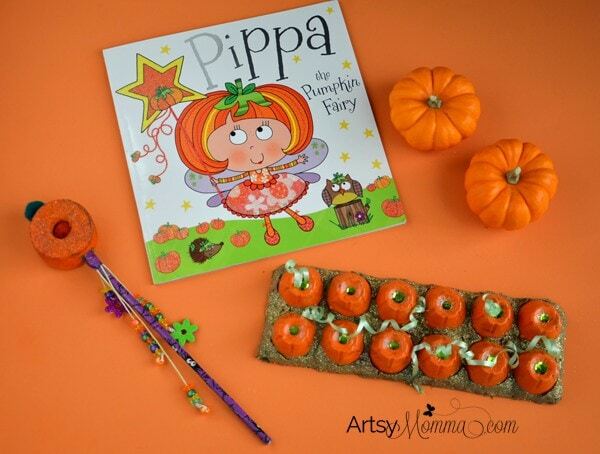 Every year for the big Fall party, Pippa uses her wand to make pumpkin lanterns. This year, her wand created the wrong kind of lanterns. She panics when her friends come over and hides them. She then lies to them saying that they will be the best ever. Her friends told other friends and the news spread making it difficult for her to come clean. In the end, it turns out everyone loves the pumpkins with their funny-ha-ha faces. Such a cute way to teach kids about honesty. I would definitely recommend this book and the whole fairy series from Tim Bugbird. We adore his books and own 3 others besides this one. Cut a small section from a pool noodle – preferably orange. We used one we already had on hand and painted it orange. Cover the wood dowel with either duck tape or ribbon and glue. We used purple Halloween Duck Tape with spiders on it. After you painted a couple coats of paint, add glitter – Fairy Dust! Guess what? The tooth fairy sprayed my daughter’s wand and pumpkin patch with fairy dust (wink!). Big Brother happened to lose his tooth earlier that same day. When I was spraying his money with fairy dust (scented glitter hairspray) I thought it would be cute to surprise Little Sister. Everytime her brother loses a tooth, she pretends to lose one too. So I knew she would love the fairy dust surprise if the tooth fairy visited her too. I also used Elmer’s green glitter glue to coat the pool noodle pumpkin – my attempt to help prevent the paint from flaking off and to give it even more sparkle. Stick the dowel through the pool noodle- Little Sister Sister loved this part! Glue a green pom pom on the top and add an orange pom pom on both sides of the pool noodle where the holes are. This is to cover the dowel from showing. Add a few strings of braiding cord, lacing cord, or similar to the dowel just under the pumpkin. Add beads to the ends. We also added glitter foam flower stickers to 2 of the ends. For this craft we recycled an empty, plastic egg container. They are easy to clean (I’ve even placed them in the dishwasher before!). The regular gray egg cartons will also work fine. 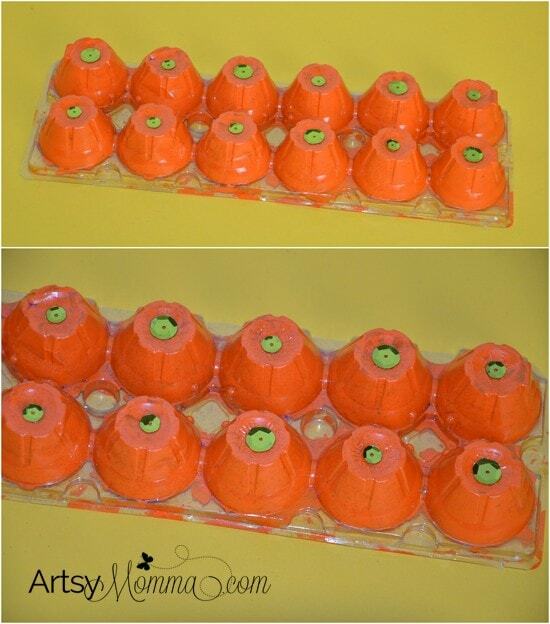 Paint the inside with a couple coats of orange paint (or the outside if not using a plastic egg carton). Spray the tops with a glitter spray- the tooth fairy did this for us (see above story)! Glue a green sequin to the top of each pumpkin. Press brown and/or green play-doh all around the pumpkins. 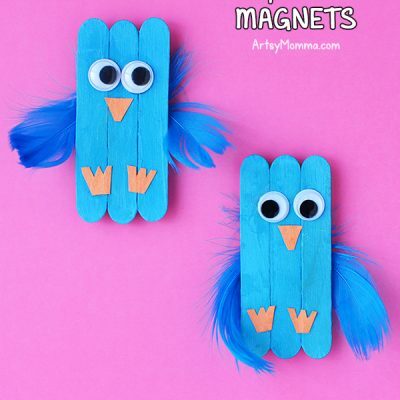 Alternatively use modeling clay, crumpled tissue paper, or paint it. Sprinkle glitter all over the play-doh. We got play-doh wet a little bit first and used Martha Stewart’s fine gold glitter. I LOVE the way her glitters look! If you are one of those people who are allergic to glitter (ha, ha …..kidding! ), you could just skip this part. 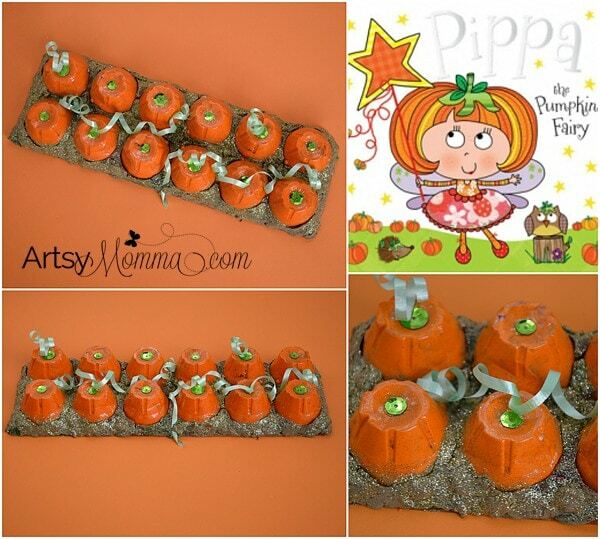 Add green curling ribbon around the pumpkins and glue to the tops of a few of the pumpkins. empty bottle with a circular top – we used one of those mini juice bottles that come in a 6-pack (for school lunches), but something like a Gatorade bottle would also work. Place the paint on a plate or shallow dish. Dip the top of the bottle in the paint. 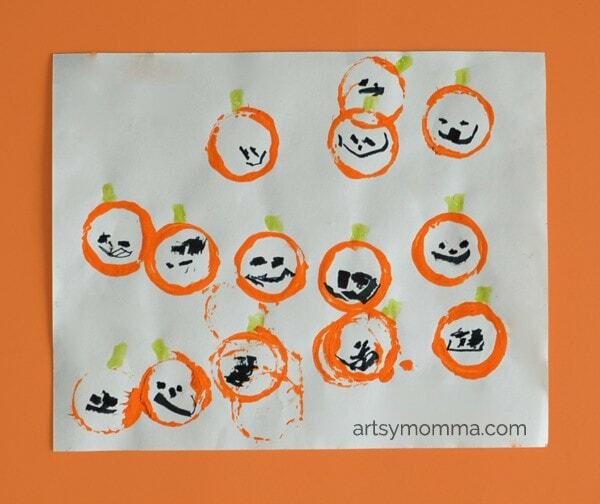 Repeat until you have lots of pumpkin circles on the paper. Draw faces on the pumpkins. Add stems. We used green glitter glue for ours. 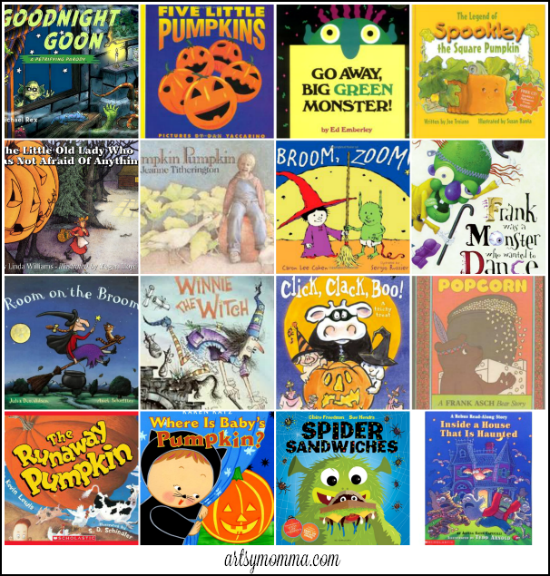 We would love for you to hop around and check out the other Halloween book-based activities from these fantastic bloggers! 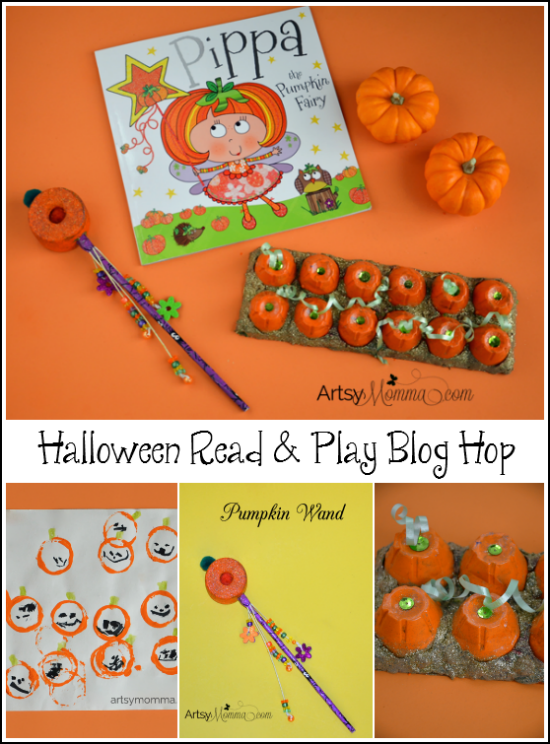 You may also enjoy the Halloween Read and Play Pinterest Board. Cute craft and the book looks adorable!